The longer we live, the more the losses accumulate, growing beside us like worm-casts. Loss forms a long list: work and opportunities, possessions and authority, health and life. Love itself, and loved people. I've just been reading about a certain Frankish prince. Kalamata-born William II de Villehardouin, who died in 1278, had earlier been the most powerful man in the Peloponnese. He was a troubadour and poet fluent in Greek and French, and had a retinue of 80 knights, while his court at Andravida, now a modest market town, was considered by all of contemporary western Europe to epitomise the ideals and practice of chivalry. William also built the castle atop the hill at ever-enchanting Mystras, near Sparta. In an interval of spare time he accompanied Louis IX of France on the Seventh Crusade. 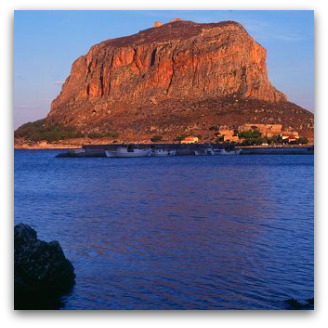 But William was also, it would seem, one of the most determined and obsessive of people: he desperately coveted Monemvasia (pictured), the towering rock of granite that has been called the Gibraltar of Greece. I have nothing! I have nothing if I don't have Monemvasia! he is supposed to have declared. It took him three years of siege to subdue the settlement, and he succeeded only after the inhabitants had been reduced to eating rats, but he learned eventually that the glories of our blood and state seldom last. Defeated in battle in 1259, he hid under a haystack, but was captured, taken far from home, and then forced to cede both Monemvasia and Mystras to the Byzantines, whose fortunes had suddenly improved. Recently my Australian farmer uncle, Barry, died. He would have been 90 this month. Not long after that, my Greek neighbour, Aristomenis, was killed in a car accident: he was 19, and had been driving back from an exam. In this day and age of celebrity, so much of reputation depends on achievement. In the eyes of the world Barry did not match his clergyman brother, who climbed to the top of the Presbyterian tree, so to speak, and was an Oxford Blue in rowing as well; nor did Barry's life resemble that of his only sister, a high-achieving and much-respected nurse. Fate decreed that he should stay home and run the dairy farm. Which he did, conscientiously and well, while coping with drought and disease and the unremitting grind of milking cows morning and night way back then. He never lived anywhere else but in his own community. Young Aristomenis had no real chance to achieve, but five minutes before he died he called in at his mother's place of work to tell her he thought the exam had gone well. He too was a product of his place, this village. How to cope with loss? That is a burning question. Somehow the bereaved manage to reshape themselves and move on, until the loss is somehow integrated. Well, that's the theory. Many of us do come, I think, to the understanding that we can at least look back and be glad that these people lived and were in our own lives, and remain in them despite physical absence. Although I know that being glad is not a consideration for Aristomenis's mother, left wondering about what might have been, left dealing with such a nightmare of pain. But that, sadly but surely, is part of the nature of love: knowing that when you love, you must be prepared to die another death before you die your own. And achievement? We all like to achieve, but what really matters at the end is what our lives have meant to other people. Barry was a faithful and happy husband for 60 years, a devoted father and steadfast friend, a respected person in his community: they knew the local church would not hold all the mourners, and so loudspeakers were set up outside. The same applied to Aristomenis. So dearly loved, so sorely missed, as the death notices of my youth used to proclaim. In a brief poem American writer Raymond Carver asked the hypothetical reader whether he or she had gained what was desired from life. Yes, was the answer. Myself beloved on the earth. Both Barry and Aristomenis were beloved on the earth. Of that there can be no doubt. I wonder, however, about William. Gillian Bouras is an Australian writer who has been based in Greece for 29 years. She has had eight books published. Her most recent is No Time For Dances. Recent articles by Gillian Bouras. Lovely thoughtful piece. I am reminded of Robert Louis Stevenson's friend Sidney Colvin, who noted, at RLS's death, that while the world would mourn the superb artist, Stevenson's friends and family would much more mourn the wonderful man, the friend you would choose above all others to sit and talk with; and that has always seemed the best measure of a life's quality to me. No matter what your feats in the world, you lived better if you are missed for who you were rather than what you did. And AMEN to all of that. Grief is the price we pay for love. I remember reading some UK research which is producing a pill to remove bad memories. We who love would never want to lose such memories. I held my dead daughter in my arms...it will alwys be the most precious and painful memory I have. "This what happens around the world; if you love, you grieve, and there are no exceptions." Thomas Lynch, U.S. poet. I do appreciate your thoughtful articles. My oldest daughter, Ingrid was also 19 when she was killed in a car accident. Something made me believe that this would help me to be a writer, and since then I have published five collections of poetry and published anthologies for others. I wrote this poem when Ingrid died. and we are not uprooted. Thank you Gillian. A very thoughtful piece and very relevant in this very busy world of ours. I too loved Raymond Carver's sentiment and believe that is what most of us ultimately want. Death comes to us all, of course, but we like to live from day to day ignoring this fact; until forced to acknowledge it, by personal loss or some public tragedy. Gillian's article as usual cuts to the centre of the question, exposing what in the end is the most important part of living, the way in which we influence the people whose lives we touch. I read Gillian's article at a bad time. Or was it a good time? This morning I was informed that a niece of mine had miscarried her first child, a little girl. Last week I was unable to attend the funeral of a close friend, two years my junior, who died after a long struggle with cancer. That they were beloved on this earth, and by me in particular, there can be no doubt. But their deaths, at the extemes of earthly existence, reminded that they are beloved creatures, beloved children really, of a God of inexhaustible and incomprehensible love. Just as William II of Villehardouin was and is. As I try on a daily basis to live a happy and productive life in my the autumn of my years it is good to be reminded that people like dairy farmer Barry exist. Even more I need to remind myself of the reality of God's providence in all things which surpasses my understanding. I have just returned from some days away in the country to find all the Eureka Street articles waiting for me. I went straight to yours. I found your theme most profound and it reminds me of my early youth when my father would play the home piano and sing a song called 'Nature Boy', by Eden Ahbez. It was in fact on the early radio hit parade at one stage. This piece was a beautiful eulogy to Barry and Aristomenis. Not knowing either of them, I suspect both would have loved it. For those of us who live and experience loss, it is love which keeps the heart beating; the world turning;the joy remaining. Many thanks for poignant reminder. Gillian - a beautiful tribute indeed to both your uncle and the boy. I imagine Barry would have been very moved by your words. I firmly believe loved ones are missed more for the kind of person they were. Thank you Gillian - as usual you get right to the heart of the matter. Sydney filmmaker Claire McCarthy spent two months working among Mother Teresa's Missionaries of Charity in Calcutta. Like many Westerners with egalitarian pretensions, the characters in her film The Waiting City arrive in India bearing a tourist's naivety.